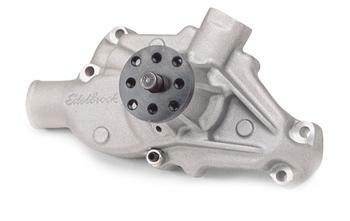 Edelbrock Water Pump - Victor Series - Dezod Motorsports Inc - Home of the automotive performance enthusiast since 2002. Edelbrock Victor Series water pumps provide maximum cooling for the street and the race track. They’re ideal to prevent overheating in street rods and street machines, as well as in tow rigs and motorhomes. Using state-of-theart racing technology, Edelbrock has designed these “super cooling” water pumps to provide maximum flow, maximum pressure and equal distribution to both sides of the engine block within 1%. Available for most popular applications, these high-performance pumps flow in only one direction for optimum efficiency. The casting’s computer-designed internal passages and precision powdered metal impeller produce the maximum flow rate possible. Standard and reverse rotation pumps are available for most Chevrolets, Fords, and Chryslers.